Moving about as a pedestrian leaves you somewhat vulnerable to injuries by vehicles since you don’t have the cushion of the metal, plastics, and seat belts that cushion drivers. 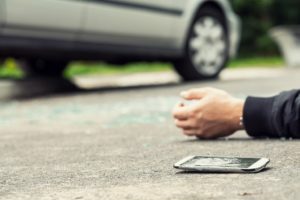 Pedestrian accidents by distracted drivers are on the rise due to the increase and prevalence of smart technology. The definition of distracted driving is partaking in any activity that pulls your attention away from the road as you are driving. Tuning your radio, setting your GPS, texting, talking with vehicle passengers, eating, or any other activity that takes your eyes and focus off the driving can easily lead to an accident with another vehicle or a pedestrian. A distracted driver can run through a red light and not even realize they entered and passed through an intersection. Their minds and eyes are not on the road. Carefully observe any vehicles approaching an intersection before you set off to cross the street. If it appears they are not slowing down, wait before attempting to cross. Vehicles are supposed to give pedestrians the right of way to walk on the sidewalk before turning into a driveway or alley. A distracted driver may not see you and turn, hitting you. Always be mindful that cars can and will turn into a driveway without giving much thought to pedestrians at times. Some pedestrian accidents can be easily avoided if both the driver and pedestrian were paying closer attention. If you are crossing a street and cannot see a vehicle coming down the road due to an obstructed view, the driver will not be able to see you either. Large parked vehicles, signs, and other objects can block the view in both directions. Look carefully around the obstruction before crossing. Contact Simon & O’Rourke Law Firm, P.C. , the pedestrian injury attorney Clear Lake residents count on for solid legal advice. You need expert advice if you’ve been injured by a driver and require ongoing medical care. Get all the compensation you’re entitled to if you have medical bills and lose work to recover from injuries. Every situation is different and you need to know if your case holds merit before entering the legal arena. The technical nature of the legal system makes it nearly impossible to try and handle a personal injury case on your own impractical. Find the right advice to help guide you to the best decisions if you’ve been injured by a distracted driver.